This is actually one of the most common misconceptions there is in regards to how pet-owning Oklahoma City residents use their climate control systems, and even their plumbing and electrical systems! By debunking these common myths, we hope to help you save as much money as possible without sacrificing your comfort or the comfort of your furry friends. It makes sense that you’d assume that during the summer, your pets would need it to be extra cold indoors. After all, they essentially have built-in fur coats. This isn’t the case, though! Now, we aren’t saying that you should leave your air conditioner off if outside temperatures creep near the 80° range or over. But most homes stay comfortably cool enough around 78°F. This is especially true if you keep your blinds and curtains closed so that the sun doesn’t beat down through your windows. Many homeowners, however, decrease the number of their thermostat all the way down to 72°, assuming that this is necessary. The truth is though, most pets are pretty inactive when home alone, and even if they are playing, their means of cooling off is by panting and not necessarily by sitting in front of an air conditioner—they essentially have a built-in evaporative cooler with their tongues. Which brings us to winter—it’s really not necessary to set your thermostat above 68° in the wintertime. In fact, even that might be higher than necessary for your pet. 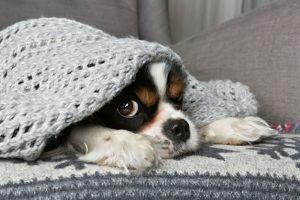 Although, different pets do have different needs, so in this case, you may want to turn your thermostat up a couple degrees or talk to your vet about what the ideal room temperature is for your pet. Most people understand that in the summer, ceiling fans are able to more evenly distribute cooled air. Well, this same concept can be applied in the winter. Thanks to a switch on the fan, you can reverse the direction of the blades, and use it to spread heat. The thing is, no matter what the season, you don’t need to do this for your pets. In the summer, it’s literally a waste as fans help sweat evaporate, and our pets don’t sweat the way we do. In the winter, it’s just an unnecessary electrical cost that can be resolved with some comfy blankets. For exceptional heating efficiency tips, heating maintenance, and heating repair in Oklahoma City, contact Comfort Incorporated today!